Public transport in Budapest is well developed and runs with high frequency, with the city served by metro, tram, trolley and bus. While it is free for people over 65 from the European Union, the single ticket price is relatively high at 350 Forint (≈1.1 € ≈ 0,98 £ ≈ 1,24$); hence the importance of consulting the different options for buying tickets or Pass for Budapest public transport. 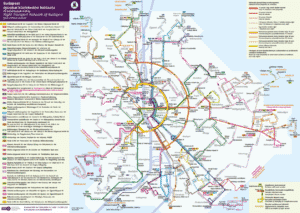 The city of Budapest is served by 4 metro lines called M1, M2, M3, M4. You can buy tickets at the counters or automatic distributors at the station entrances. The lines M1, M2, M3 intersect at the station ‘Deák Ferenc Tér’ (city center): you can change lines without having to use a new ticket. The Budapest Metro is operational between 04:30 and 23:00. 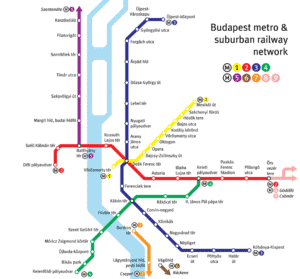 You can download the Budapest Metro map on this link (click on the icon at the top right to download). 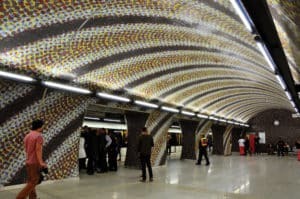 Do not miss the metro station ’Szent Gellért’ on the M4 line (between the Liberty Bridge ‘Szabadság híd’ and the Gellért Baths) with its fascinating mosaic! 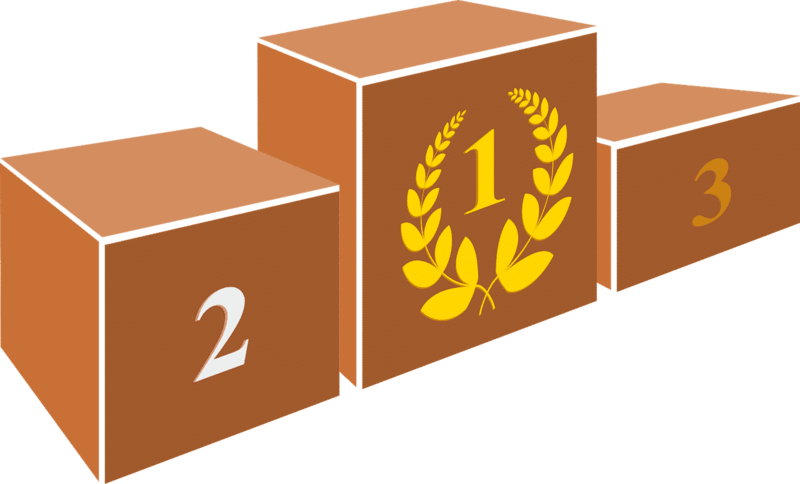 (picture above). 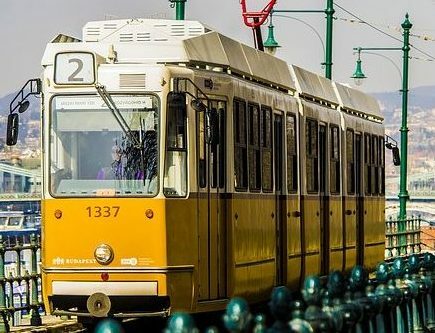 The tramway allows you to discover Budapest, without the worry of traffic. You can buy tickets at the vending machine at each station (credit cards not accepted). Trams run between 04:30 and 23:00. Of note, line 6 crosses Pest center and operates 24 hours a day. 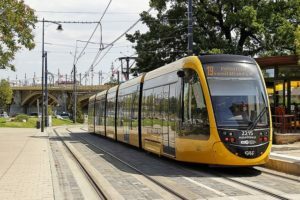 The American magazine, National Geographic, has ranked Budapest’s tram line 2 as the most beautiful in Europe and the 7th in all the world. 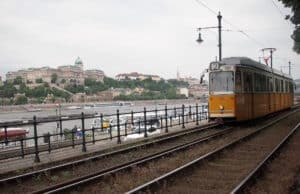 This line runs along the Danube and offers a unique view of Parliament and Buda Castle. You can download the tramway map of Budapest (called ‘Tram lines’ on the map) on this link (click on the icon at the top right to download). 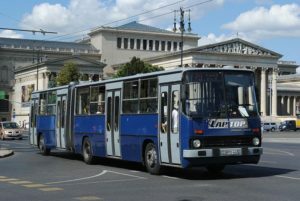 Buses and trolleybuses (buses running on electricity) cover Budapest’s large public transport network with 250 stations. They are operational every day from 4:15 to 21:00 or 23:30 (on some lines). 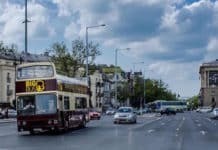 You can download the Budapest bus / trolley map on this link (click on the icon at the top right to download). 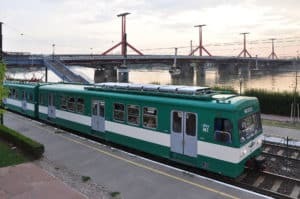 The ‘HÉV’ is a suburban train that serves Budapest and its surroundings. The price of a ticket for the HÉV is the same as other public transport in Budapest as long as you stay in the city. Its price increases thereafter according to your destination. It is very useful, for example, if you want to visit the beautiful little town of Szentendre located just 20km from Budapest along the Danube. Many bus lines operate at night, especially on the hubs of Astoria, Deák Ferenc Tér, Móricz Zsigmond körter, Blaha Lujza Tér, Örs vezér tere and Széll Kálmán tér. The list of nocturnal bus lines is available on this link of the dedicated website. (common to all Budapest public transport). Unit ticket price: 350 Forint (≈1,1 € ≈ 0,98£ ≈ 1,24$) at a ticket counter or a vending machine. If purchased from the driver onboard the bus, unit price is 450 Ft (≈1,45 €≈1,29£≈ 1,64$). Price of a block of 10 tickets: 3000 Ft or 300 Ft each (≈0.97 € ≈0,86£ ≈1,1$). There is also a group travelcard (for 1-5 people traveling together) at a price of 3 300 Ft (≈10.6 € ≈9.4£ ≈ 12$) which allows you to travel at will for 24 hours together. Unlimited use ticket price for 24h: 1,650 Ft (≈5,3 € ≈4,7£ ≈ 6$). Unlimited use ticket price for 72h: 4 150 Ft (≈13,4 € ≈11,9£ ≈ 15,2$). A ticket for unlimited use for 7 days is called ‘Budapest-hetijegy’ and costs 4,950 Ft (≈16 € ≈14,2£ ≈ 18,2$). As a reminder, public transport in Budapest is free for people over 65 from the European Union. 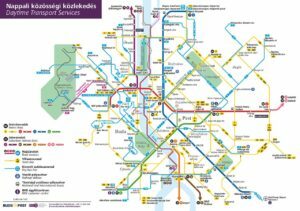 You can buy tickets and transport passes in metro stations, tourist offices (found at the airport and city center), in some news kiosks (Relay chain for example) and with the vending machines in tram and metro stations. Most counters are open from 5am to 10pm. Note that your ticket is only valid for single use of a line, except for the metro (as long as you do not leave the underground network). As it is very useful, you can use Budapest’s public transport route planning tool available on this link. It will ask you where you want to go from here to Budapest and will suggest different options by metro, bus and tram. 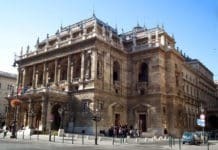 The city of Budapest also offers the Budapest Card, which provides free use of public transport in the city, and also free admission to 13 Budapest museums, discounts of up to 50% for more than 80 monuments, and special events and gastronomic experiences. The 24h (≈18 € ≈16£ ≈ 20,4$), 48h (≈28 € ≈24,8£ ≈ 31,7$). and other (72h, 96h, 120h) cards are advantageous if you plan to visit the sites that are part of their reduction program. 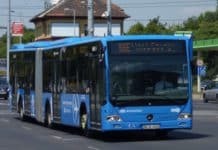 Be careful, though, the Budapest Card does not include the use of the 100E bus that connects Budapest Airport to the city center. 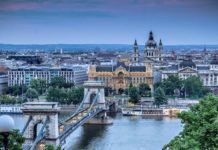 Find detailed information on the benefits of the Budapest Card on this link. 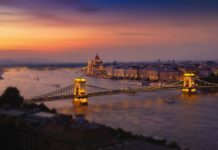 Even if you buy your Card online in advance, you will need to ‘physically recover’ it in Budapest in order to use it. 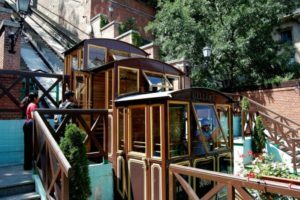 The funicular, located in Buda in front of Clark Ádám Tér Square at the exit of the Chain Bridge, allows you to reach the Castle district directly in a few minutes. Ticket price: ≈4 € one way and 6 € round trip per person. 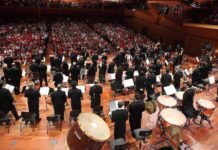 It is operational every day from 7:30 to 22:00. The use of the funicular for the castle is not included in the Budapest Card. The climb up the stairs to the Castle district is also possible or you can also take the bus number 16 (less expensive) on Clark Adám Square: 2nd stop station ‘Dísz tér’. 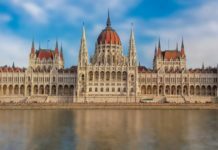 To discover Budapest, do not hesitate to consult our articles, Visit Budapest in 2 days, 3 days or 4 days.